People often ask if beef broth can be used instead of beef consommé. Not only is beef broth easier to find, but people also think that broth and consommé are exactly the same. Are they really interchangeable? If you have the same question, you are in the right place. 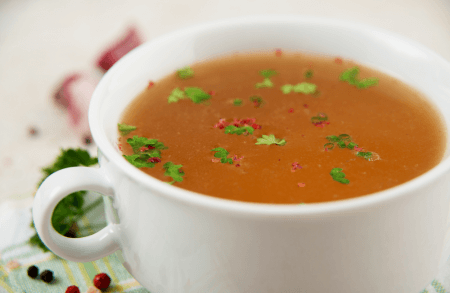 This article will explore the difference between beef broth and beef consommé. Beef broth is a savory liquid that is made by simmering tough portions of beef (e.g. shank, bone marrow) in water. Traditional broth only requires beef, but other ingredients such as parsley, celery, onions, or peppers may be also be added. The liquid is cooked over low heat and should not be brought to a boil as boiling can result in a cloudy broth. Additionally, the fat or grease solids should also be removed from the liquid. A good beef broth is a clear light brown liquid that has a mild yet distinct beefy taste. It can be consumed as is and can be used in recipes like soups, sauces, and gravy. Since its ingredients are fairly common, beef broth is easy to make at home. It can also be bought from grocery stores in liquid and solid form. Homemade beef broth may take hours to make so most cooks prefer to use the commercially prepared ones to save time. Beef consommé, on the other hand, is clarified broth. It is produced by simmering a combination of grease-free beef broth and egg whites. Onions, carrots, celery, parsley, tomatoes, and even ground beef may be added to enhance the flavor. After several hours of heating, the egg white binds the impurities and causes a grayish raft or layer to form on the surface. This layer is then removed by straining to leave a clarified broth. The word consommé means “perfect” or “to make complete” in French. Although beef consommé is a clear, amber liquid, it has a thick texture and a rich, concentrated flavor. Beef consommé is a finished dish itself. It can be served as a hot soup and can be added to different recipes such as stews. Beef broth is a clear, golden brown liquid made by simmering tough portions of beef in water, whereas beef consommé is a clear, deep amber liquid made by simmering a combination of egg whites and beef broth and then removing its impurities by straining. In short, beef consommé is clarified beef broth. The greatest difference between the two is that beef broth has a thinner consistency and a milder flavor than beef consommé. 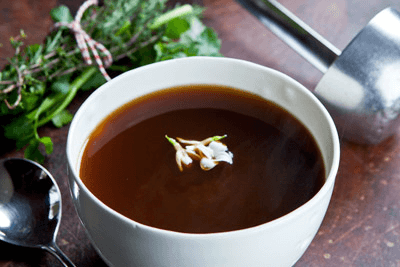 Beef consommé has a thicker consistency and has a more concentrated, powerful flavor.